Hastings United are through to FA Cup third round qualifying after an amazing 4-3 win away to Leiston yesterday. Hastings United manager Chris Agutter felt the football club thoroughly deserved to win a ‘crazy’ game yesterday (Saturday). 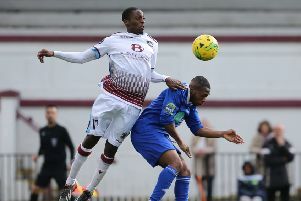 Hastings triumphed 4-3 away to higher grade Leiston in Emirates FA Cup second round qualifying despite finishing the match with eight men and an outfield player in goal. From 2-2 at half time, Hastings opened up a 4-2 lead. Leiston pulled one back after the first Hastings red card, but despite having two more players dismissed, Hastings held on for a hugely satisfying victory. Sam Adams (2), Daniel Ajakaiye and Kelvin Ogboe got the goals. “I can’t really put it into words really,” continued Agutter. “Up until the first sending-off I thought we were in complete control. When we went 4-2 up I thought ‘game over’ to be honest because we were that comfortable. “It was fantastic from the players to get into that position against a team from the league above. It wasn’t just that, it was how we played - we were really dominant. Hastings goalkeeper Charlie Horlock was the first player to receive his marching orders, for what the referee deemed deliberate handball outside the penalty area. Sam Cruttwell and Jamie Fielding received their marching orders later on, both for two yellow cards. “We looked at Charlie’s and it’s not a handball,” said Agutter. “We’ve got that on video, it will be sent to the FA and hopefully that will get rescinded, I’m pretty sure it will. The win earned Hastings £9,000 from the FA’s prize fund (on top of the £8,890 the club had won in the previous two rounds) and a place in tomorrow’s third round qualifying draw.